Here is quite a bit of information on recumbent tadpole tricycles, as found on the website called Recumbent Trike (dot net). Read below, and then visit the website for additional information. A recumbent trike is a tricycle that allows the rider to sit in the reclining position. The seat is designed to be comfortable and the rider can rest his back against a support while riding. The result is fantastic – the rider sits comfortably and travels distances while enjoying the cool breeze! In essence, a recumbent trike is a variant of the recumbent bicycle with the extra wheel. The bicycle too is designed so that the rider can position his back comfortably against the back rest. Both the bicycle and the tricycle have an ergonomic advantage. The trikes are very comfortable to ride with the added benefit of safety and ease of use. The trikes offer a full frontal view and come with the added benefit of a lower center of gravity. To ride a trike, you need not learn the art of balancing. The activity as easy as sitting on a chair that is provided with pedals and wheels! In a conventional bicycle, the rider learns the fine art of balancing along with proper ‘positioning’ of his body weight on few inches of seat. In the case of a recumbent trike, the rider can evenly distribute his body weight along the back rest and wide seat. The performance level of these tricycles is more superior as compared to the conventional models. The recumbent trikes are known to have outperformed the upright ones on long distance journeys. So much so that they have been banned from being used in international racing events! Recumbent trikes can take you over longer distances as compared to the upright bicycles. The reason for this is obvious; a recumbent is like a seat that places no stress on your wrists, buttocks, neck or shoulders. Hence, long ride journeys become easier and less stressful. Many of the trikes place a rider in the ‘aerodynamic tuck’ position. As a result, you can easily pick up appreciable speed while riding. A recumbent trike can be used on steep roads as well. You may not be able to stand on the pedals while exerting extra pressure in climbing steeper roads, but you can definitely make good use of the leverage that a resting back offers. Recumbent trikes usually sit low and hence, are believed to be unsafe for riding. Although they sit low, they are easily visible to the eye of the automobile driver and hence, can be ridden on roads without any fear. While riding one, do keep in mind that you engage a different set of muscles and hence, may experience ‘pain’ in the initial days. 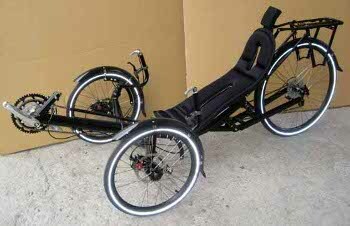 Recumbent trikes are very easy to learn, and an excellent choice for people who have medical problems. Purchasing a recumbent trike is simple – all you need is your favorite search engine. You will come across many e-vendors who sell them. Alternately, you might even want to look up the manufacturers’ websites for purchase options. These tricycles are reasonably priced and usually come as fully assembled pieces. The recumbent trike is your answer to a fun filled outdoor activity session. A recumbent trike is your companion over long distance journeys. The advantages of a trike are impressive – they allow you to exercise your ‘recumbent muscle groups’ without causing severe strain to your neck, wrists or shoulders. There are two main types of recumbent trikes, the tadpole trikes and the delta trikes. The Delta trikes are the ones which come with one wheel in the front. The other two wheels are placed behind the front wheel thus forming a type of triangle. This is the ‘steering wheel’ that drives at least one rear wheel. In some models, the steering wheel may drive both the rear wheels. The one-wheel drives tend to pull to one side while climbing or accelerating. This can be bothersome for the rider. The delta trikes are usually inexpensive and come with over seat steering. The OSS offers the rider the advantages of an aero dynamic position that makes it simpler to ‘walk the bike’. In a delta trike, you can even mount your computer on the bike with ease. The recumbents are typically higher and easier to get in and out of, as compared to the tadpole variant. However, these recumbents are also bulky and heavier. They are the less sporty ones and are often priced at much lesser figures as compared to tadpole trikes. The other type of recumbent trike is the tadpole trike. This trike is designed in just the opposite manner; it has one wheel placed behind and two wheels at the front. Thus, it has two steering wheels that drive the rear wheel. These bikes come equipped with under seat steering. This makes the riding experience more relaxed and comfortable. The tadpole trikes sit lower than the delta ones and are regarded as the sportier variant of the two. The reason for this is obvious; these trikes are designed to be sleek, lighter, smaller and faster. However, it is more difficult to get in and out of these trikes. The tadpole trikes are more expensive than the delta ones. They are less maneuverable at lower speeds and are easier to control at higher speeds. Thus, they are meant for the more serious rider who frequently travels over long distances. The choice of a trike entirely depends on you. You might want to ask a few questions. Do you wish to travel longer distances? Is a trike a necessity or it an object of pure pleasure? Your purchase decision entirely hinges on the purpose of owning a trike. Before settling for one, you might wish to take a test ride. It might seem to most readers that a tadpole trike is the best choice, but whether it is the bike for you depends on what you find comfortable. There are many people who prefer the more bulky delta trike as well. Never buy one without a test ride because you might happen to be one of those who enjoys riding a bulky trike over a lighter one! Recumbent trikes are the comfortable alternative to upright bicycles. These ‘seated tricycles’ are even known to outperform conventional bikes. The trikes are stable on roads and come equipped with a back support that lets a rider ride with ease. The ergonomic design of the trike is the primary reason for it being a ‘safe and comfortable’ riding accessory. A recumbent rider distributes his body mass across the seat and the back support. Hence, he can cover long distances on the trike without straining his joints. Your recumbent trike could be fitted with a wide range of accessories. Are you a gaming addict? Do you love your computer so much that you cannot part with it? If the answer to any of these questions is a yes, then you might wish to mount mini computers on the ‘dashboard’ of your trike! You might need to take help for fitting it right, but once done, you can enjoy your favorite movie on the go! A good way to make your ride comfortable is by investing in the right type of seat cover for your trike. Different models need different types of covers, so while searching for the right one, make sure that you have your trike specifications with you. Another good accessory is a back cover that permits extra comfort and support for your back. Like the seat cover, back covers too are designed exclusively for different types of models. Seat pads and seat meshes too, can make your ride comfortable. Bike mirrors can be purchased from the bike dealers. You might want to equip your trike with reflectors, radios and safety flags. If you are worried about your trike’s safety, then you might consider the option of investing in a good lock. A good kickstand and pedals ensures that your ‘triking experience’ is hassle free and enjoyable. A cautious rider must wear a helmet on long journeys. You can get different types of helmets and for the fashion conscious, customizing the helmets is always a good option. You might want to use stickers or reflectors to make your helmet the ‘coolest thing to own’. It goes without saying that a helmet is an absolute must for people who love to ride. A good headlight is also another necessity for a safe journey. There is a wide range of variety when it comes to recumbent trike gear. You can choose from an assortment of clothes, footwear, cassettes, fenders, bottles, tools to ‘customize’ your trike. The best place to hunt for trike gear is the internet. You need not take a trip down to the local stores in order to find what you were looking for. You can browse through product catalogs and place orders online. The biggest advantage of shopping online is the price factor. You need not pay the ‘overhead charges’ to the e-vendor, and hence, your purchase could cost you a lot lesser than what it would have in a departmental shop. Once the order is placed, all you need to do is sit back and relax. Your recumbent trike gear would be delivered at your doorstep! This entry was posted on October 6, 2010 by Wild Steve. It was filed under Triker's World . does anyone know where i can find some different flags for my trike? Try a Kite shop they have a wide variety of eye catching Flags & also Tail Spinners too! You can also find flags for trikes on Amazon, Ebay & Walmart.com Also with the built in L.E.D. tail lights.